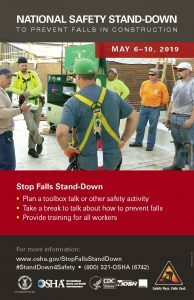 Stop Construction Falls | Safety Pays. Falls Cost. In order to make participating in the Stand-Down as easy as possible, we’ve gathered some of our top resources in one location. Everything you need to conduct a stand-down, including worker handouts, training materials, videos, and posters is available here. To learn more about what the Stand-Down is and why and how you should participate, visit our About the Stand-Down page. The reach of this Campaign and the National Safety Stand-Down has been extensive – with millions of workers pausing work to learn more about fall prevention and staying safe on the job. But what exactly has made it so successful? How has word spread so that so many companies participate each and every year? To find out, CPWR – The Center for Construction Research & Training worked with the Center on Network Science (CNS) at the University of Colorado Denver, to conduct a Social Network Analysis (SNA) on the network of partners that has been developed through the Falls Campaign. SNA is a process of mapping and measuring the relationships and flows of information between people, groups, and organizations. To learn more about which groups and organizations are participating in the Campaign, how they are engaging with one another, and what the benefits and challenges have been, check out this Executive Summary.